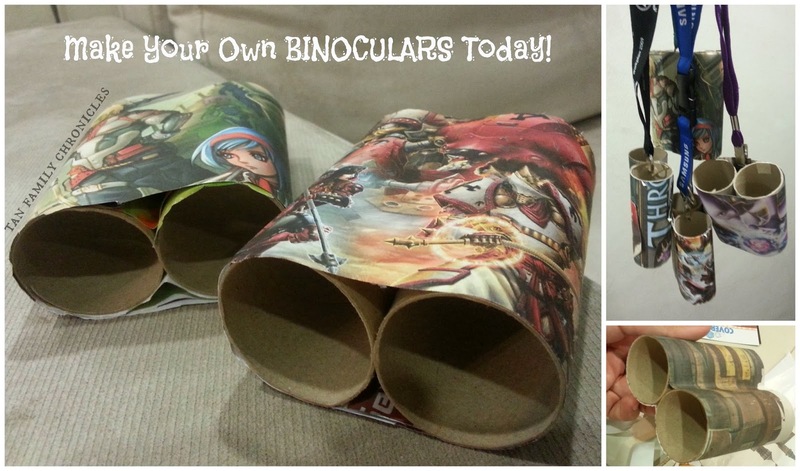 Tan Family Chronicles: Make-Your-Own-Binoculars Today! Another very easy craft to make, you basically take two toilet rolls, some magazine paper or wrapping paper, and stick it around the two toilet rolls. I favour using double sided tape, but you can use glue as well. You can also pull the paper straight across the middle (above, left picture), or you can tape it to the contour of the roll (above, bottom right picture), up to you. Oh and you know all those conferences, or talks you attend that give you all those lanyards? Don't throw them away! Here's a perfect way to use them, just attach them to the binoculars and the kids can hang them from their neck :) They love to do that! I love crafting, but I don't like the mess of sticky gooey paint here, there and everywhere.I much prefer cutting and pasting of paper - yes I don't mind picking up bits of paper :p So here, I have the kids cutting and pasting paper. If the kids have tons of stickers, or you have a stash of washi tape - now's a good time to break them out! :) Of course, if you really want to, you can paint it!!! It was so easy to make that we made one for the twins' friend, Aluna, whom we were going to meet for a playdate the following day :) That's why we have 4 binoculars above! Great way to recycle! I also think I prefer stickers and paper, but alas the kid loves painting more. Haha. Thanks for linking up this idea! Love all your craft-y ideas (crafty also means as crafty as a fox crafty leh, so I put a hyphen, you know what I mean)! Btw, nice photo! Taken by iPhone? Kisses are the best medicine ever!